The partnership unveiled at the Dementia, Care and Nursing Home Expo seeks to offer 55s a greater choice of health and well-being, living standards, community and social interaction. The partnership aims to create innovative design solutions that are supported by technology and environments that would rival 5* hotels, but delivered affordably to existing providers, whilst increasing customer demand and revenue. Cowan said the importance of creating a sense of real community was central to the initiatives, so that there was a strong emphasis on the living experience, including the maintenance of community and social interaction. The healthcare provider in turn benefited from customers enjoying longer, healthier and happier lives, the architect said. 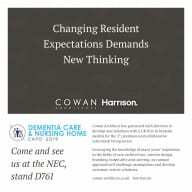 The post Cowan Architects and Harrison launch first bespoke premium retirement models appeared first on Care Home Professional.